Central government has launched mobile application for Ayushman Bharat Scheme or Pradhan Mantri Jan Arogya Yojana for smartphone users. Now all the people can download Ayushman Bharat – PM Jan Arogya Yojana (AB-PMJAY) app from the google playstore. 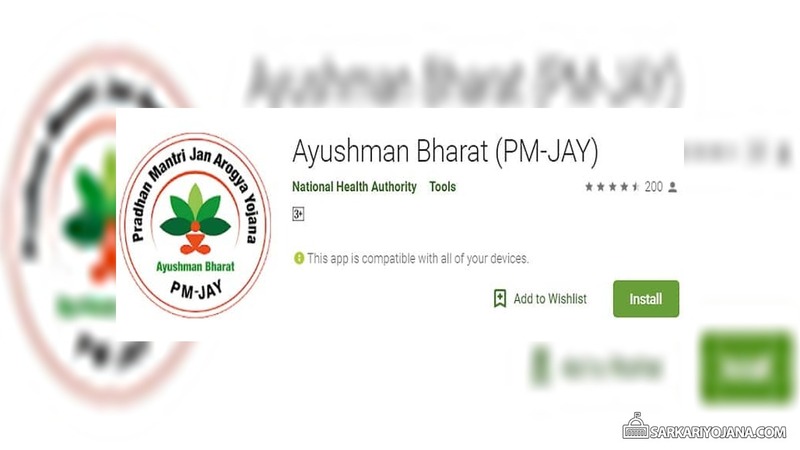 National Health Authority has developed Ayushman Bharat (PM-JAY) mobile app which is of 4.52 MB size and is currently available for android users. PM-JAY is a flagship scheme of the Modi govt. to provide cashless secondary and tertiary care treatment from the empanelled public and private hospitals. AB-PMJAY scheme provides coverage to more than 10 crore poor and vulnerable beneficiary families. This PM-JAY mobile app has already recorded over 10,000 installations in the 2 days. AB-PMJAY App offers easy access to information on the scheme and will allow them to check eligibility, find nearby hospitals and receive help. Users can even check their wallet at this PM-JAY mobile app of Ayushman Bharat Scheme. This AB-PMJAY app will display how much money has been used and people can also register their grievances here. This PM Jan Arogya Yojana mobile app was under testing for the last few days and has already reached 10,460 downloads and the central govt. expects this number to touch a lakh. Ayushman Bharat Yojana was launched by PM Narendra Modi on 23 September 2018 from Jharkhand. PM Jan Arogya Yojana is going to benefit around 55 crore people and will provide Rs. 5 lakh for secondary and tertiary care hospitalization through a network of Empanelled Health Care Providers (EHCP). Till date, 10.33 lakh beneficiaries have been hospitalized and claims worth Rs. 1041.3 crore have been settled out of which around Rs. 808.2 crore has already been approved. Moreover, around 60,328 hospitals have applied for empanelment and out of which 14,434 (24.40%) have been empanelled till now. Moreover, govt. has issued 4.63 lakh more cards, so the total number of cards now reaches 1.28 crore. This Ayushman Bharat (PM-JAY) app would also address the issue of rise in fraudulent apps which lure smartphone users and redirect them to pay with false promises of enrollment in the PM Jan Arogya Scheme. People would be able to get access to all information related to PM Jan Arogya Yojana. Moreover, people can easily check eligibility and can even search empanelled hospitals. Google has given assurance that after the launch of this AB-PMJAY mobile app, this app will now figure at the top of the list through search engine optimization. Around 28 states and union territories are on board currently with the scheme.